Enforcement agencies in Malaysia have been particularly busy this summer with a rash of illegal wildlife trade seizures. Contraband caught in transit by Sabah Customs Department has included tonnes of elephant ivory and pangolin scales, including one record-breaking shipment of pangolins scales weighing in at a staggering eight tonnes – reported to equate to approximately 16,000 individual poached animals. In addition, the Department of Wildlife and National Parks Peninsular Malaysia has seized almost 2,000 reptiles and dozens of wildlife parts from illegal trade, including tiger and bear parts. In many cases of illegal wildlife and timber seizures made routinely around the world, such incidents are often used as a high-profile photo opportunity for the media. “It is a familiar routine when major seizures of contraband wildlife occur,” said Julian Newman, EIA Campaigns Director. 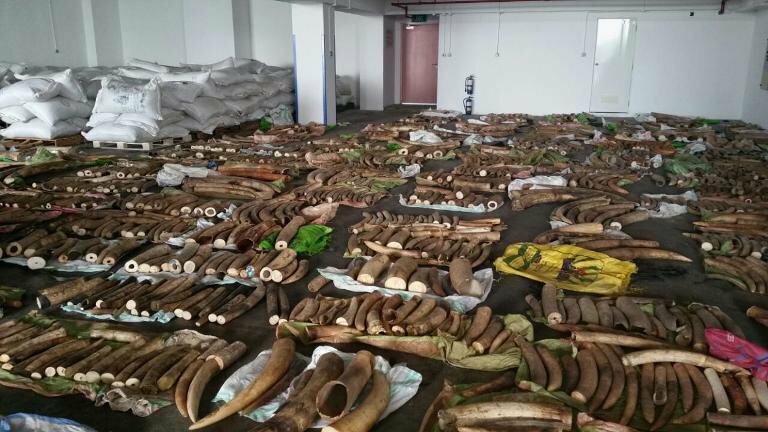 “The local authorities, usually customs, lay out the seized products such as elephant tusks, rhino horns, pangolin scales or rosewood and hold a press conference announcing their success. Then the products are put into storage and all too often the case is forgotten, with nobody prosecuted. In July, EIA’s report The Shuidong Connection revealed the activities of a trio of Chinese ivory smugglers who had been in the trade for about decade. One of the three had significant shipments of ivory seized on three occasions but was never identified by follow-up investigations – and so continued his nefarious activities unimpeded. If the cameras are brought in as soon as a seizure is made it is a fair bet there will not be a meaningful investigation as the very act of publishing the seizure serves to tip off the syndicate members. In many countries, customs do not even have the mandate to investigate beyond the port area. What is needed are multi-agency investigations into the seizures, which should commence as soon as the contraband is intercepted. These should include parallel financial investigations and, where possible, controlled deliveries to identify the final recipients. In EIA’s experience, major seizure cases contain a host of clues leading to the culprits in the source and destination countries. Only when enforcement actions go beyond just making the seizure will the criminal syndicates involved in wildlife trafficking be dismantled.